As he seeks another term in 2018, Gov. Greg Abbott is seeking to build on the inroads he made with Hispanic voters when he first ran for governor in 2014. SAN ANTONIO — Greg Abbott may not have a serious opponent for re-election yet, but he is already running against one group in particular: those who say Texas’ Republican governor can’t make further inroads with the Hispanic community in the era of Texas' "sanctuary cities" ban and Donald Trump. Abbott made that much clear here Saturday as he addressed his campaign’s inaugural Hispanic Leadership Conference, rallying the Republican crowd against Democrats looking to unseat him — and laying the groundwork for a long-term push for Hispanic GOP support. 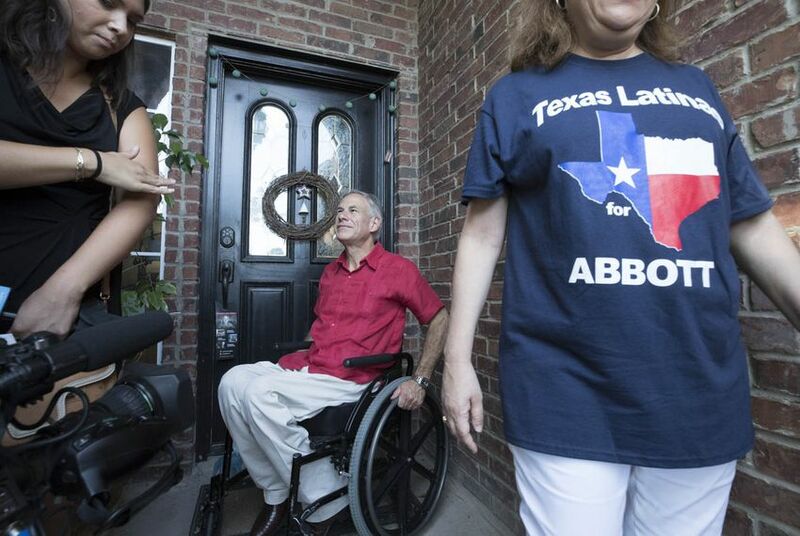 The conference, attended by 250 activists, was the first in a series geared toward a goal that’s becoming central to Abbott’s re-election bid: growing the 44 percent share of the Hispanic vote he received in 2014. Looking to 2018, his campaign wants not only build on that number but to do so substantially, with an eye on capturing a majority. “We plan to wage, if necessary, hand-to-hand combat with our opponents to win the Hispanic vote,” Dave Carney, Abbott’s political chief, said in a recent interview. Abbott, who made the Rio Grande Valley his first stop after launching his re-election campaign in July, is so far chasing the Hispanic vote without the presence of a serious Democratic opponent for 2018, though the party insists one will emerge. In the meantime, Democrats point to a variety of factors they believe will hinder Abbott’s outreach efforts, including his party’s incendiary president, Donald Trump, and the state’s new "sanctuary cities" law that Abbott championed. Senate Bill 4 in particular, they say, presents a steep new obstacle for Abbott to overcome with the Hispanic community, which he wooed in 2014 by touting that his wife, Cecilia, would become the state’s first Hispanic first lady. Abbott supported Trump when he became the GOP’s presidential nominee last year but kept his distance at times. Since Trump has taken office, the two have aligned on a host of issues, including the push to outlaw so-called “sanctuary cities” — which Abbott spearheaded long before Trump won the White House. In addition to being deeply skeptical of Abbott's push for Latino support, Democrats like Garcia question whether Abbott really received 44 percent of the Hispanic vote in 2014. The oft-cited number is based on exit polling, which some pollsters have criticized as misrepresentative of Hispanic voters, particularly in the wake of the 2016 presidential election. Abbott began his speech here Saturday by evoking the centerpiece of his Hispanic outreach since he launched his 2014 campaign: his wife, Cecilia Abbott, the first Hispanic first lady of Texas. Sprinkling in some Spanish — mi familia to refer to his wife's side of the family — he spoke of his connection to the Hispanic community through his marriage as well as the values he believes the community shares with the GOP: faith, family and freedom. It was a largely apolitical speech until Abbott pivoted to a discussion of the challenges Texas faces going forward — namely from “Democrats who seek to divide us as a state,” Abbott said. Toward the end of his speech, as he urged more Hispanic Republicans to run for office, Abbott pulled out a baton. Abbott, an avid runner before the paralyzing accident he suffered in 1984, said he plans to keep the baton, which he signed and left a message on, in his office. That is, he added, until he can hand it off to the next Hispanic Republican to win statewide office — maybe even the highest of all. Most recently, Hispanic Republicans have won election to several statewide positions, including land commissioner (George P. Bush) and state Supreme Court justice (Eva Guzman). But the top office has remained elusive for Hispanics of both parties. “The first Hispanic governor must be a Republican,” Abbott said, pausing between words for emphasis. Abbott is hoping to keep engaged Hispanic Republicans like Rudy Madrid, who unseated a Democrat in 2014 to become Kleberg County judge — making him the southernmost GOP county judge in Texas. In an interview on the sidelines of Saturday’s conference, Madrid recounted how he grew up a Democrat but drifted toward the GOP after a stint in the military. Then he found himself solidly in Abbott’s camp during the 2014 gubernatorial race, drawn to the governor’s fiscal conservatism, among other things. As Abbott asks Hispanic supporters like Madrid for another term, the county judge says he has not seen any cause for regret during Abbott’s first two and a half years in office. He said he has been particularly impressed with Abbott's commitment to overhauling the state's child welfare system.